ARE YOU A FRONT HANGER, OR A BACK HANGER?? Are you a front hanger or a back hanger? Changing the empty toilet roll I wondered WHY I have to have toilet paper coming from the front and just have to change it round anywhere if it is the wrong way! compulsions I have….even though I think it is the man of the houses job to check all doors and windows are locked, and get irritated if my man doesn’t do it….I STILL then have to get up and secretly check if he has done it or I cannot sleep. Then there is this odd compulsion I have to make up stories in my head, ( remember the train journey) whenever I find my self alone, with strangers around. I thought everybody did it! I have an odd thing about not having my clothes washed in the same load as somebody else’s. The thought of his dirt and my dirt mixing makes me feel queasy. Then, in order to sleep, I just HAVE to get into a perfectly made bed, with hospital corners that matron would be proud of. Of course I cannot relax on holiday unless I have left the house spick and span with the laundry basket emptied….”for the burgaler you know” as Pater kay would say! My daughter recently found herself in a cleaning frenzy the week before they went to Lanzarote, “I’m turning into my Mum!” she cried. In my defence, my way of hanging the toilet paper is scientifically right ,according to this article. 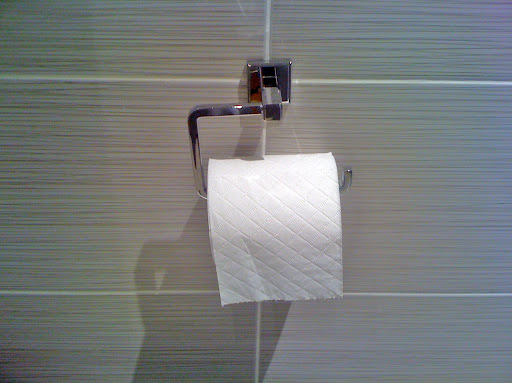 But it does not explain why I feel I have to change a TP roll whenever I come across one hung the “wrong” way. Psychologists would say these little rituals make us feel secure and safe and only become a problem when they get out of hand and take over our life. This is called Obsessive Compulsive disorder and is a serious psychological disorder. Meanwhile I will continue to change TP rolls and put toilet lids down! Previous post ← "I LOVE DADDY BECAUSE……." Denise, of course toilet paper has to hang from the front, it just isn't right any other way! I also rehang it when I come across a roll that is back to front.I also like to make up stories about people in my head especially on long journeys, I used to think that there was something wrong with me for doing this but realised a few years ago that I am not alone and it helps the journey to pass more quickly and can be really fun!I don't think I share any of your other compulsions and the only other one I can think of that I have is to correct spelling mistakes when I come across them! I used to go into shops and tell them if their signs were incorrect much to the embarrassment of my children. You're not invited to my house then!! 😉 I like my loo roll the other way round, although I wouldn't go around changing any I ran across! And I think cleaning before you leave makes sense, I already hate having to unpack and do a huge load of laundry when I come back from holiday, so it's nice to have the place clean and fresh sheets and so on instead of coming back to a tip. No doubt about it – I'm a front hanger. Oddly enough, I think that at some point along the way Stephane converted me from being a back hanger to a front hanger. I didn't realize it until I noticed that my mother was a back hanger who always changed the toilet paper around in her bathroom when she would come for a visit.I wish that I would create stories about strangers on the train. Instead I spend my time thinking about what I should do, need to do and haven't done.I'm trying to remember if my blogger friend Joseph the Butler has done a post on the right or wrong way to hang toilet paper. I'm sure that he will have an opinion. HA! Mary Kay sent me this entry. I think I know what I have to write about next week. Thanks. I'm a front hanger, but unfortunately my pain-in-the-neck cat likes to unspool the roll. My husband keeps telling me to hang it from the other way so he can't do it, but I can't bring myself to do it. I think the cat should change! I agree NYC girl. The cat SHOULD change!…..or clse the bathroom door! LOL!